Coban Rondo is a waterfall in Batu, Malang, East Java. 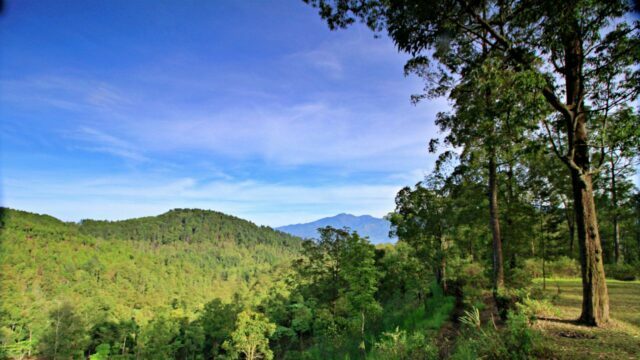 It is located at the slope of Mount Banyak, 1135 m above the sea level. Coban Rondo features 84 m high waterfall surrounded with a sprawl of tropical greens. Only an hour from Malang. The close proximity makes it a favorite escape from the city’s hustle and bustle. Coban Rondo means “The waterfall of a widow”. The name is inspired by a local legend. People say the story begins when a newlywed couple traveling. But they suddenly facing an enemy who desired the woman. The wife, Anjasmara, ran to the waterfall to hide. While the husband fought the enemy. The husband lost and died, leaving the now widowed wife mourning for the rest of her life. It’s hard to believe that the waterfall has a tragic story. It is now a lively place. 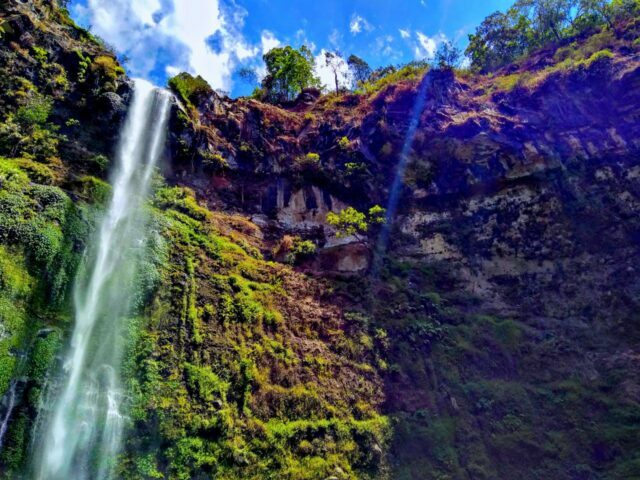 Opened in 1980, the waterfall continues to be one of the most visited destinations in Malang. A labyrinth garden recently just built to offer more excitements. The pine forest nearby is also a favorite spot for camping, biking, and other outdoor activities. Flowing from a spring Cemoro Mudo, water flows down heavily from the 84 meters canyon. The water discharge reaches 90 liters per second in the dry season. In the rainy season, the discharge can reach 150 liters per second. 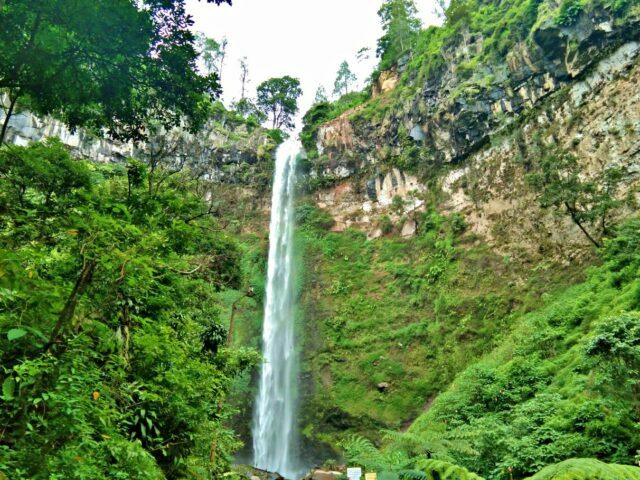 In short, Coban Rondo Waterfall is beautifully powerful. Perhaps this is the reason why there’s a yellow line sign. Prohibiting tourists to get close to the water. The high cliff combines with the strong force of water. Making the area prone to a landslide. However, do not be discouraged to explore the waterfall. There’s a small river where the water continues to flow. Take a plunge here to taste the chilly mountain water. Apart from swimming, the river is fun for tubing. For those who don’t know. Tubing is an activity where a person is strapped on a tire then glides through the river currents. Imagine one-person rafting – it’s pretty much like that. And since Coban Rondo’s river is by no means calm, expect the same excitement as if it is real rafting. 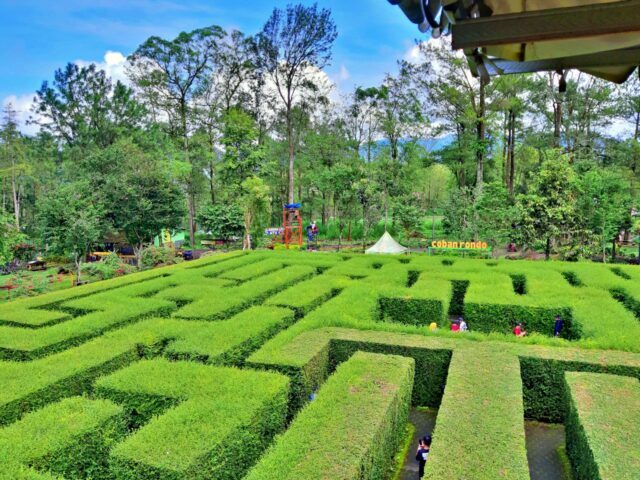 Solve the puzzle at the labyrinth of Coban Rondo. The walls here are 2-meter height and the maze is quite challenging. Find the way to the prize, a fountain with a koi pond in the middle of the labyrinth. The route here is always changing every two weeks. So forget about looking for a cheat sheet from the internet. However, there’s a viewing tower nearby if visitors want to take a peak. At Coban Rondo, there is no short of activities to do here. A zip line hangs across the labyrinth. For anyone who prefers sliding down into the maze, rather than solving it. Coban Rondo also has the arena for paintball and archery. Depending on preference, pick either a gun or a bow, both offer an equal amount of fun. Animal lovers can meet deer and monkeys who live around the area. Pet and feed the deer but be careful with the monkeys. Monkeys are mischievous and they do not hesitate to take belongings. 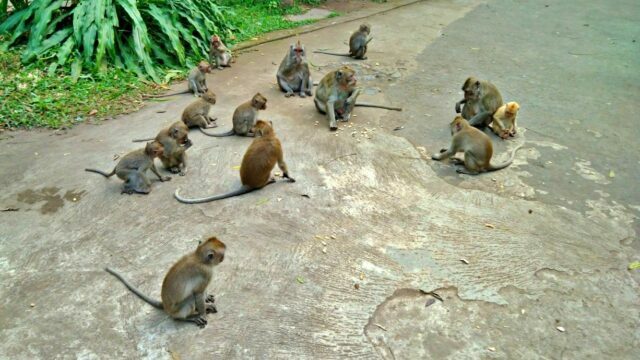 Coban Rondo was once filled with these primates. Sadly their number has been declining significantly. The pine trees here invite for forest exploration. Thanks to the paved road. Visitors can forget muddy difficult tracks and instead, can focus on the scenery. Rent an ATV to get around the area faster. An ATV costs IDR 30k to rent. A slower but healthier way to explore the forest is by a bike. It is also cheaper as a bike’s rental fee is only IDR 5k. Along the way, meet and greet the locals who are working at their field. There’s also an apple farm nearby. During the harvesting season, it’s more than welcome to join an apple-picking party. Although Coban Rondo opens daily for 24 hours. The attractions mostly open from 7 AM to 7 PM. There's a parking fee, IDR 10k for cars and IDR 4k for motorcycles. See: Goa China Beach, Malang, Explore The Cave & Watch The Sunset View. Coban Rondo has two kinds of tickets. The regular tickets cost IDR 22k for entry to the waterfall only. The premium tickets, cost IDR 35k, gives visitors access for games and rides and also the labyrinth. See: Three Colors Beach, Malang, Trekking to Conservation Area. Coban Rondo provides many facilities for tourists. The parking space is spacious. It is surrounded by a row of food vendors and souvenir stalls. Other basic facilities include toilets and an information center. The road toward the waterfall is paved, providing easy access and also wheelchair-friendly. Tourists can rent a motorbike from a rental nearby Malang Station (IDR 65k/day). With private vehicles, Coban Rondo is a straight drive from Malang to Trunojoyo Street for the first 22 km. Once arriving at Trunojoyo intersection. Pick the left lane heading toward Mount Banyak. Follow the winding mountain road for 5 km to get to Coban Rondo Waterfall. Using public transport minivan, take ADL/AL van from either Malang Railway Station or Malang Bus Station. Stop at Landungsari Terminal then continue with BJL van heading to Batu. Get off in front of Jatim Park 2 and change into a van with route Batu-Kesambon. Ask the driver to stop near the waterfall entrance.